At the South east corner [?] of Coniston there is a small wooden pier that can be easily reached from the road with service equipment. So if you get a 'breakdown' the boat can be towed there for 'on the water' work and restart from land based batteries. That is unless you do what we did with K8 and have a 'battery boat' following her in case of power need. This Pier is where Tony Fahey tried to remove the it by getting his right sponson caught under a pier upright and put full power on. He used it to refuel and restart using a large array of batteries. I can state that a tow back from here is painfully slow having done it several times with K8 ! Remember K7 is meant to go fast and at slow speed she will be the proverbial pig to tow. she will be low in the water with all the resulting resistance and if the waves build up [its the Lake District ! the weather changes quick] or you tow too quickly there is a chance of taking on quite a lot of water [ as per K8] making the tow harder still. A swamping would be a disaster. Can't start K7 with batteries... Couldn't do it then and can't do it now. Well, couldn't with an Orp', but you could with a Beryl. I'm sure the original intention was to have a compressed air cylinder on Louis boat at the far end. Indeed, the very bottle was in use at Filching to take air to cars in storage to "re-round" tyres. I suspect it simply didn't have the capacity. Yes - I ought to have qualified that. You'd need a big old bottle to decant into the Orph' start system. It holds 32 litres of air at 3200psi. It was a big bottle (bloody heavy), on a lovely "barrow" made by Leo, but as I said, I don't think it had the capacity. Wasn't there enough air "on board" for about six starts (obviously ignoring any running re-lights)? Wasn't there enough air "on board" for about six starts (obviously ignoring any running re-lights)? That's the figure that somehow seems to have been captured by history but reality is rapidly disproving it. 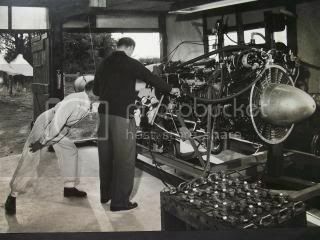 The start system was designed for the Hunting 162 or is that 126, I can never remember, so it's a fair bet that as well as a piston pump and a hyd pump there'd have been a generator too. K7 lacked the generator, preferring instead to run the boost pumps from a pair of batteries for the short duration involved but even with that missing the start system is good for only a couple of starts and matters would be even worse with cold oil. I reckon on the aircraft it would give one good one. The BBP's work is also featured on this page. Yes, available now on DVD. There's an error on the cover though- they've missed off the lawn mower record. Looking at that cover picture on the DVD, I am reminded again that Mr Campbell certainly had style as well as courage and bravery by the bucketful. I think I will be ordering a DVD.